Tomahawk is a full service, one stop shop for all your promotional needs. We offer full service screen printing operation, computerized embroidery capabilities, complete graphic services and the full array of promotional products. Click the question below to display the answer. How much will my shirts, koozies, stickers, etc. cost? All orders placed through Tomahawk are custom quoted according to quantity, styles, and color. Please see one of our Customer Service Representatives for a custom price quote. You can visit or call us at 615-896-7958. Or you can start the process on our request a quote page. How long does it take to get products made?  Tomahawk Screen printing prides itself on a quick turnaround time. Our standard turnaround time for screen-printed shirts is 5-7 business days after the approval of art. In most cases, the entire process takes no longer than 2 weeks. We also welcome and accommodate rush orders. Rush orders can be produced in as little as 2-3 days after the approval or artwork. A $25.00 charge will be assessed for every day under our standard 5-business day turnaround after the approval of art. For embroidered products, our turnaround time is 2 weeks from the approval of a sew-out of your artwork. If we need to digitize your artwork (that is, turn it into a pattern of stitches to be sewn by our automated machines), please allow an additional 4-5 working days depending on the complexity of the design. For promotional products, such as cups, pens, key chains, etc. the turnaround time varies. For most products, turnaround time is 7-10 working days from the approval of artwork. Some, however, can take up to 4 weeks. See our Customer Service Representatives for an exact production times. Also, don’t forget to allow time for the shipment of goods! Do we have to pick a design of yours or can we submit our own idea? Customers can submit their own artwork, either digitally or hand rendered. If you aren’t feeling creative, let our art department custom design artwork for you. Our artists are more than happy to create custom artwork for you, at no cost for the first hour of art time! In most cases, art time does not exceed one hour. However, for complicated recreations or overly complex design work, please anticipate additional art time. Art fees are incurred after the first hour of artwork, and are $25.00 per hour. If submitting artwork, please refer to the digital art requirements for acceptable digital formats. If submitting hand rendered art, please ensure the artwork is black and white with clean, thick line-work. Artwork done in pencil is not accepted. Please note: all submitted artwork is subject to an art fee. Yes. You can email digital artwork to art@TomahawkTshirts.com, but please speak with one of our Customer Representatives prior to emailing artwork so that we can have your order ready. Do I need to make an appointment to start my order? Appointments are not necessary to begin the ordering process. We begin orders on a first come, first serve basis. It is best to come in before the lunch hour to avoid a wait time. After your order has been initiated, an art appointment will be scheduled, at which time your artwork will be completed. Can I sit down and design my shirt with your artists? Yes. We do allow for clients to work individually with the artists. We also have several Customer Service Representatives who can help by discussing possible design ideas with you. If you do not have a pre-conceived notion of a shirt design, our artists will be happy to create a custom design for you with the information and colors you would like to use. Can we choose our style of shirt/bag/glass? Yes, we have a multitude of styles and colors to choose from. Feel free to come and check out our catalogs. Is there a minimum quantity to order? The minimum order for screen-printing is 24 pieces, and there is a 6-piece minimum for embroidery orders. We do not process orders with quantity of one. The minimum order for promotional products can vary, but the average minimum is 72 pieces. Some companies will produce less than minimum orders, but be advised there will be a price increase for such orders. See our Customer Service Representatives for pricing details. Can I put the design on any color I choose? Some designs look better on a particular color. We strongly urge our customers to stay within our recommendations to ensure quality. Also, be aware that dark shirts are more expensive and also require an additional underlay screen for colors to remain bright. When can we change our artwork? You may change artwork at any time before production begins. Once a customer has given us signature approval on artwork, production will begin and Tomahawk will no longer be responsible for any errors or changes to artwork. You will be charged an art fee for edits requested after you have signed off on the artwork. All new screen printing orders will have a one-time setup fee of $15 per color per location. This setup fee cannot be waived on any new orders. However, these setup fees do not apply to reorders. Embroidery setup fees are dependent on the complexity and size of your artwork. On average, digitizing costs range from $75-100. This setup fee cannot be waived on any new orders. Again, these setup fees do not apply to reorders. The setup fees for promotional products vary, ranging from around $30-$50 on average. While there are setup fees for reorders of promotional products, they are usually less than the original setup fee. What qualifies as a reorder? A reorder is an order that a customer has already placed with Tomahawk. All artwork must remain exactly the same to constitute a reorder. For screen printed orders, even the slightest change to artwork will require new screens, and will therefore not be considered a reorder. Some embroidery orders may only require a slight editing fee for minor changes, such as a date change. If you have any questions, you can always ask a Tomahawk Customer Service Representative. The minimum quantity of 24 and 6 pieces still applies to screen printing and embroidery orders, respectively.